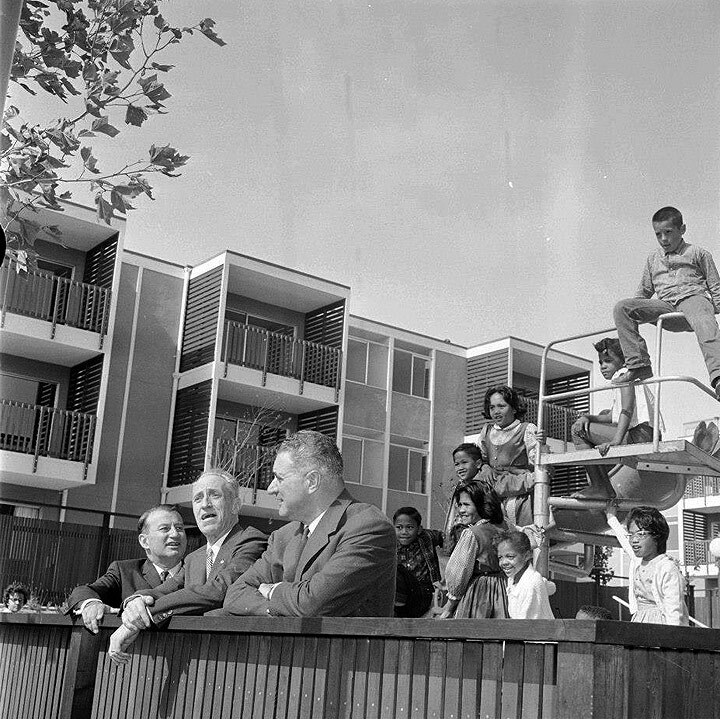 Justin Herman, Harry Bridges, and George Christopher at new apartments for the ILWU in the Western Addition, Aug. 6, 1963. “Recent expressions from the office of the Redevelopment Agency seem designed to stampede residents of the second Western Addition Project Area into the belief that mass evacuation of their homes is obligatory and inevitable, and that each family would do well to find its own separate solution to the problem of dislocation. The ILWU serves notice now that it will urge its members to join with all other tenants in A-2 in a mass refusal to budge from present dwellings until each and every family in the area has been provided with a home fit to live in at a price they can afford. “ILWU enunciates the principle of “An injury to one is an injury to all.” It is disgraceful that the Redevelopment Agency cannot even find two-thirds of the former residents of A-1, Local 6 asserts its determination that tenants of the A-2 area shall not simply become “missing persons” lost in the tragic confusion of being uprooted from their homes. A few months later in May 1964, The ILWU-PMA Longshore Redevelopment Corporation along with Marquis and Stoller, Architects, submitted to Mayor Shelley a proposal on Relocation in A-2 which would overcome the worst aspects of the mass evictions in A-1. This proposal demanded that relocation be planned in three phases and that no families or individuals need move until housing for both low income and moderate income could be offered in the Western Addition neighborhoods. The first phase would construct low to moderate housing on unoccupied commercial sites which would not require any families or businesses to be relocated. Once this new housing was completed, relocation would begin and then that vacated housing could be demolished or rehabilitated to provide homes for the next phase in relocation. The ILWU plan would require land be sold at rock-bottom prices, using low interest loans, with tax exemption for a limited number of years. Additionally, investor-sponsors must be willing to forego profit, taking only a nominal rate of investment return. Basically, it was the formula which made St. Francis Square possible. Redevelopment’s response was that the ILWU’s Plan presented to Mayor Shelley was, “precisely what the Agency has proposed.”! But the relocation disaster of A-1 was still a vivid memory. In the 1960s, neighborhood activism was a growing force. Mayor Shelley and later Mayor Alioto, and the Board of Supervisors were responsive to this growing movement and it slowed the Redevelopment Agency’s plans for A-2. In March 1966, two years after the Local 6 called for action, Hannibal Williams and Mary Rogers gave leadership to the Western Addition Community Organization to oppose the Redevelopment Agency’s plans for A-2. The group soon became known by the acronym of WACO and brought together many organizations–church groups, and others, including many from St. Francis Square. WACO filed a lawsuit against the Redevelopment Agency and won a court injunction which gave them the right to representation in Redevelopment’s decision-making process. It was the first time in U.S. history that such a neighborhood action had been won. Out of the movement Wilbur Hamilton, a Black minister, was hired as A-2 Project Director and after Justin Herman retired, he led the Redevelopment Agency for ten years. Former Redevelopment Agency official Carlo Middione describes the relationships and politics of the Agency with the ILWU and the local African American churches. 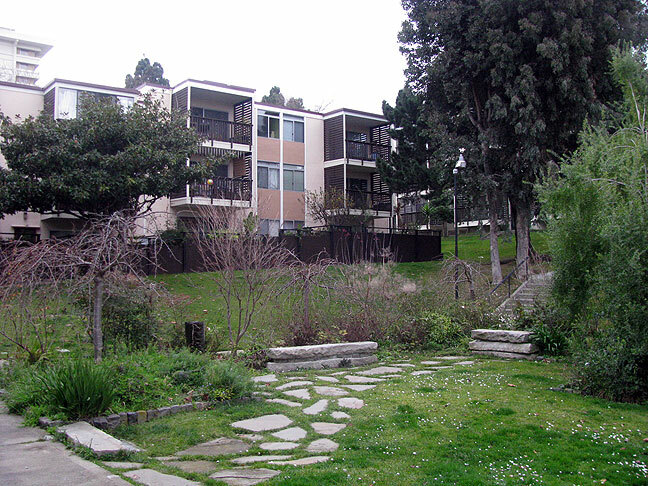 August 20, 1964, Laguna Cooperative Apartments built by developer/architect Joseph Eichler. 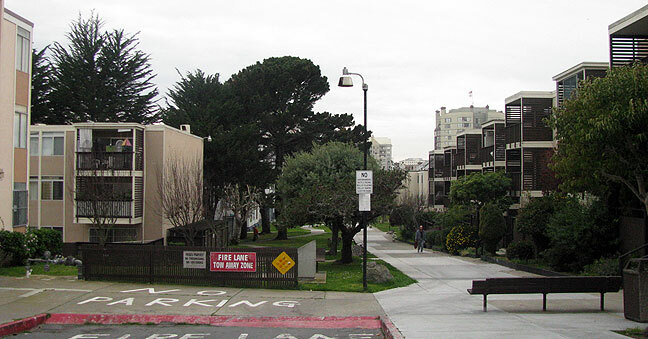 St. Francis Housing Co-operative grounds, 2010. With the success of St. Francis Square as a model, several new affordable cooperatives were built in the A-2 area: Martin Luther King Square, Marcus Garvey (which later joined to become King-Garvey Cooperative). A group called the Labor Assembly for Community Action headed by Black ILWU leaders, including Bill Chester and Leroy King, sponsored two cooperatives—Loren Miller Homes and Amel Park. 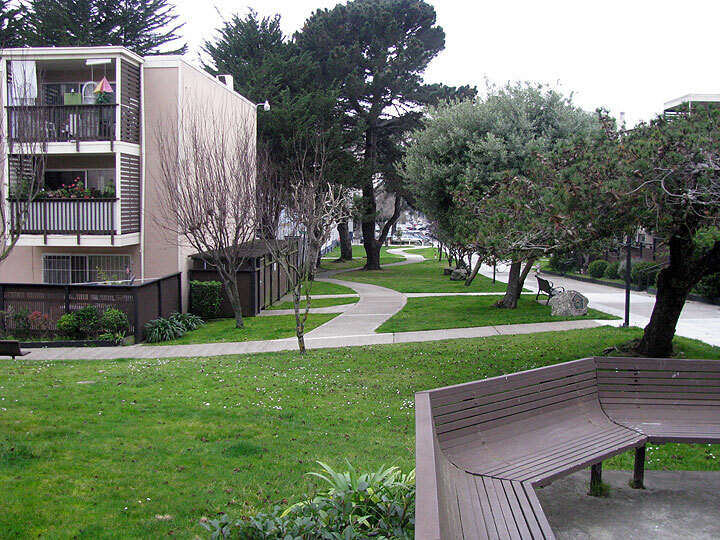 In the 1980s, the ILWU-PMA Pension Fund sponsored a second cooperative, the 72-unit Amancio Ergina Village. Freedom West, the largest Western Addition co-op built on four square blocks was sponsored by Bethel AME Church located at its corner. This Church also operates four housing developments in A-2: Laurel Gardens, Prince Hall Apartments, Thomas Paine Square and Fellowship Manor, all for low- and middle-income families and seniors. Another apartment developments built on the old Acme Brewing site is Friendship Village. Redevelopment’s actions in A-2 did respond to the community’s involvement, and the ILWU and St. Francis Square can be proud of their role in this improvement. Did Friendship Village and other apartment developments provide better homes than the ones they vacated for the families relocated in the A-2 area? What about the commercial businesses? Through the 1980s, the total was one Safeway supermarket, and several fast-food chains on lower Fillmore Street. 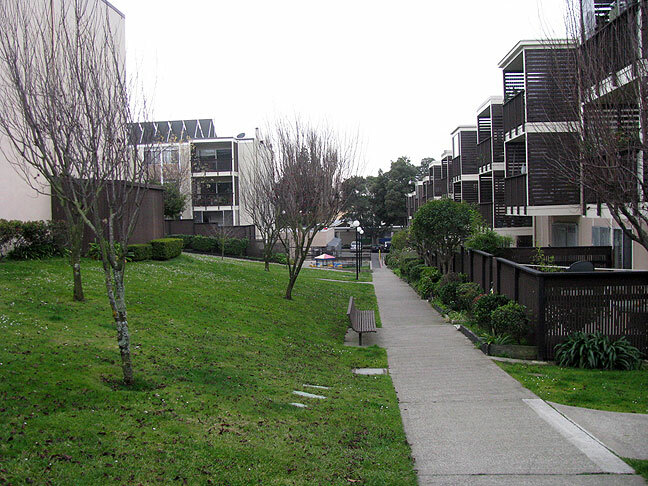 A walk through the area south of Eddy Street will take you past the apartments built during the initial A-2 period from the late 1970s to the 80s–they are well maintained, but one after another instills a certain institutional quality. Occasionally, you will also find a few restored older apartment buildings, which add color and variety. 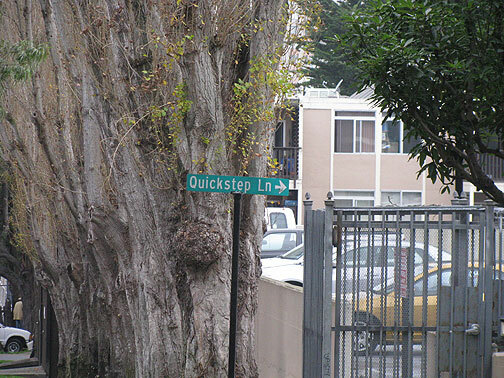 You can also walk through two areas near the border streets of A-2 which have rows of restored Victorians, with signs declaring them “Historic Districts”—Bush Street between Fillmore and Webster, and Alamo Square, beginning at McAllister and Steiner. In the A-2 Project, Redevelopment did “relocate” many Victorians. But when you learn that 2,500 of these Victorians were demolished in A-1, it makes you weep to think of what the Fillmore could have been if Redevelopment had spent more of its millions on grants to those existing owners to rehabilitate their homes. St. Francis pedestrian lane, 2010. 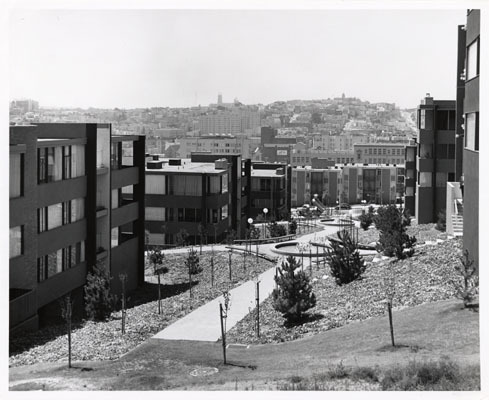 In 2008, a SF Chronicle editorial stated, “Sad Chapter in Western Addition History Ending.” It reported the closure of the Western Addition Redevelopment Agency 52 years after the first demolition began in 1956. “The thriving Black business community was destroyed and owners of barbershops, banks, nightclubs and retail stores were forced to close up shop. ... Though the Agency promised to move people back into the neighborhood after the Project was completed and help the business community recover, the area sat empty for years. By the numbers: 883 - the Number of businesses closed 4,729 - the number of household forced out 2,500 - the number of Victorian homes demolished $50 million - Amount spent on the project. St. Francis Square has survived, and many of its surviving “originals,” now in their 70s and 80s, are still with us and nurture nostalgic memories of years when many children at play was a constant sound. In 2004, we made our last mortgage payment and were no longer governed by our Regulatory Agreement with HUD—the successor to FHA. For the prior eight years, members studied the changes and options we had to consider when the mortgage would be paid. After much information was shared, discussion and meetings held, we had to make our decision. Would we continue as a limited-equity co-op, a market-rate co-op, or convert to a condo? Each choice had pros and cons, but when mailed balloting was completed, 50% voted to become a market-rate co-op, 25% voted to continued as a limited-equity co-op, and 25% voted for condo conversion. The vote provided a clear choice. St. Francis co-op, end of Galilee Lane, 2010. The recent years have brought new families, ready and willing to serve on committees and to become part of the Square’s governing Board of Directors. Our current Board includes one long-term member, three members who have bought in to the market-rate co-op after 2004, and one “original.” Our committee chairs also represent a mix of post-2004, second generation, and long-term members. We have an active and involved leadership which has to make tough decisions, such as increasing payments into our reserves to sustain the maintenance demands of our aging buildings. The Square’s needs are ongoing, but new members and old are giving them a great deal of tender, loving care. 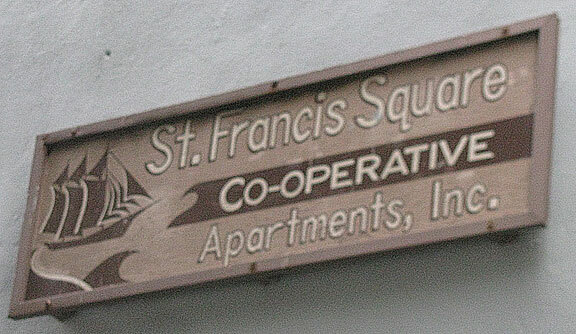 Sign for Quickstep Lane, one of numerous paths and streets named after ships and waterfront-related terms at the founding of St. Francis Cooperative Apartments. Note: This presentation has used materials from the St. Francis Square Cooperative Archives Project, which includes several folders on S.F. Western Addition Redevelopment Project.